I was reading a local blog recently and came across a tongue in cheek post about traffic in Alpharetta. The premise was that Alpharetta is doing all these nasty things that will actually make traffic worse. There were a number of misconceptions in the post and it concerned me that there might be some confusion on these points down here in Roswell as well. As a member of the Roswell Historic Gateway Community Advisory Group, I am aware of the challenges of balancing traffic capacity needs with livability and aesthetic needs. So, I decided to compile a number of common traffic misconceptions together and elaborate on them for the benefit of my readers. Many assumptions that would seem to be logical at first glance actually end up being mostly incorrect when put to the test. One of the biggest is the assumption that density brings traffic. Residential or commercial density with no where to go and nothing to do creates traffic as everyone has to leave their home by car to do even the most mundane of tasks. That's just one misconception of many that we will address below. Making Roads Narrower Creates Congestion - The conventional wisdom is that narrower roads bad for traffic like narrower arteries are bad for your heart. This is moderately true. First, let's look at a little info on lane widths. The authority on highway and road designs, the AASHTO Green Book, recommends that local roads be between 9' and 12' in width, collectors be between 10' and 12' and that arterials be between 10' and 12' with 11' being the minimum in rural areas. Now, those are some really wide lanes if we decided to go to 12' in all areas. That would mean that a four laner with no shoulder and no median would be over 48' in width. That's quite a bit of real estate. Now, let's say we narrow that down a bit to 10' and think about what it will do to the flow of traffic. Well, not much according to several studies. The worst of which shows a 6.66% decrease in flow while the best shows no meaningful change. Narrowing lanes also makes the driver more vigilant and in turn causes the driver to drive more slowly which flies in the face of the next myth. Narrow Lanes Cause More Accidents - Believe it or not, this isn't actually true in all cases. Studies show that narrowing a lane from 12 feet to 10 feet has no noticeable impact on the number of accidents that occur on the street. So, the concern of increasing crashes when lanes are narrowed is not actually a concern at all. However, if you take lane widths down below 10 feet on a non-residential road, you will likely experience an increase in collisions. The historic district currently has narrow lanes in many areas and they work just fine for both capacity and safety. They also work pretty well contextually helping to create a sense of place. We have character and capacity with relatively narrow lanes. What we really need to do is kill the reversible lanes (which is a stated objective of the historic gateway project). Mixing Pedestrians with Cars Creates Congestion - Putting pedestrians ON the road with cars would definitely wreak havok on traffic and local ERs. The assumption is that making roads pedestrian accessible increases traffic. Mixing pedestrians with cars doesn't impact traffic either way unless there are other factors at play. However, if properly designed, a highly walkable environment encourages people to get out of their cars and walk. There is less of a reason for cars to be present. Thus, we could make the assumption that there would be fewer drivers. Generally, if there is high pedestrian traffic and high automobile congestion, it is because the location is a desirable location. It is not because the pedestrians are there. Building a road that accommodates pedestrians will not in itself create traffic. However, if you build a place that people want to be, you might see some traffic. Roswell already has one area where pedestrians are very active. That is Canton Street near the Atlanta Street/Alpharetta Hwy intersection. The traffic there isn't due to the pedestrians, sidewalks, crosswalks or narrow road widths. The traffic there is due to the demand of the location. If we wanted to widen the lanes and add more lanes and take away the sidewalks, we'd be losing something very special that many other cities envy. Build places that people want to be and you're going to get some traffic. High Density Development Creates Traffic - This one is legitimate under the assumption that you pack people into condos and create a dense SINGLE USE environment. Single use environments are a sure fire way to create traffic. Mixed use development can induce traffic as well but it doesn't have to. It really depends on whether the street network is set up to provide multiple routes and whether there are enough destinations within the mixed use area to encourage people to walk significantly more than they would in a less dense environment. Perimeter Center is a bad example. Atlantic station is an excellent example. This study by the the Transportation Research Board concludes that a doubling of residential density coupled with an increase in nearby employment, transit and mixed use can decrease vehicle miles traveled by 25%. No one is calling for Atlantic Station in Historic Roswell. However, working on gridding the street network to provide more connectivity and driving, biking, walking options should be a strong focus of any redevelopment that occurs in the area. Lowering the Speed Limit Creates Congestion - This one actually is true.. but not as much as you might think. The reduction from 45 mph to 35 mph is only about 3% of capacity. To go from 45 to 30, you're going to cut capacity by slightly more than 5%. So, you're really looking at trading capacity for safety. A collision at 30mph is significantly less damaging (especially to a pedestrian) than one at 45 mph. I've included a telling chart on pedestrian death by speed. If we want a safe environment for everyone, we should design the street from the river to the square for 30mph and enforce a 30mph limit on that stretch. It's 1 mile of road and 30mph isn't going to kill any commute. You go slower than that on 400 sometimes. So, what are real solutions to traffic? First, remember that traffic isn't necessarily a bad thing. Most of the time, it means that you are somewhere that people want to be. 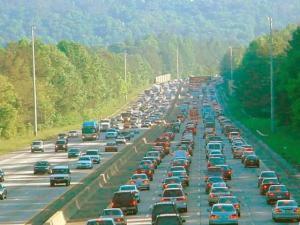 However, Americans collectively spent almost 500,000 years stuck in traffic in 2007. That is more than double the 14 hours the average person spent in traffic in 1982. This was not because America was narrowing roads, building bike lanes and walking more. It was actually because we were spreading out, widening roads and trying to run every errand in our car. Food for thought when thinking about how we want to move forward. Below are some of the best tools out there for traffic mitigation. There are too many small tools to list so I'm sticking to the big ones. Zone for Mixed Use Development - The objective here is to reduce the nubmer of trips that residents, workers and visitors need to make while allowing the flexibility to drive if needed. Atlantic Station is a phenomenal example of MU development. A study of AS residents showed that after moving into the neighborhood, residents experienced a remarkable 73.5% reduction in daily vehicle miles traveled. If you have visited AS, you would notice that there is a quality public realm that encourages walking and pedestrians and cyclists are able to safely cross roads and cars can still freely move though the networked street pattern. We need both vertical and horizontal mixed use in the historic district. This will create the interesting and walkable environment that the vast majority of the residents here are looking for. When I say vertical, I'm thinking of a maximum of 4 stories with retail or office on the ground floor. Network your Streets - Connectivity is a key to reducing traffic congestion. The problem with the suburban land development pattern and the amount of traffic we experience is that in far too many cases, there is only one reasonable way to get from point A to point B. In an environment where the road is networked, there are many different routes to get to the same destination. Find Reasons for People to Use Their Cars Less - This could be any number of things not the least of which is $3.60 gas. Create meaningful neighborhoods. If more neighborhoods had shopping, jobs, parks and entertainment closer to the actual residents, those residents would drive less. This takes us back to the Atlantic Station example above. You'll notice that I don't have transit on this list. A large misconception about transit is that it should relieve congestion. It actually has very little to do with congestion. Rather, it creates modal diversity and offers redundancy and flexibility within the system. It also allows the underserved 30% of the population that can't or shouldn't drive to function in society without being a drain or a risk. I hope I've made some sense here and I'll be happy to provide studies that affirm the statement above upon request. Additionally, if you are ever curious about the hidden causes of traffic, please pick up the book Traffic by Tom Vanderbilt. It should be required reading for new drivers. His blog is www.howwedrive.com and is very interesting.